If you want to step up your freelance writing game start here. 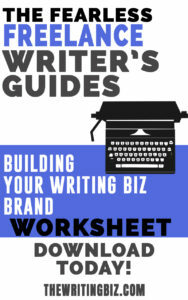 Each of the Fearless Freelance Writer’s Guides tackles a struggle that you may have as a writer. 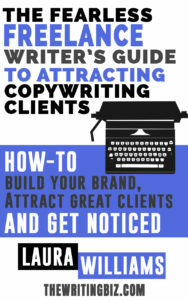 I offer you advice and resources that can help you overcome the difficulty and grow your writing business. There are more titles in the works! 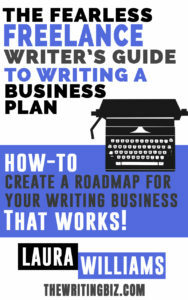 As you fill out The Fearless Freelance Writer’s Business Plan Template, you create a comprehensive roadmap that will guide you through the year. You will learn the needs of a growing business, understand your strengths and weaknesses and develop a deep understanding of how you can accomplish your goals. 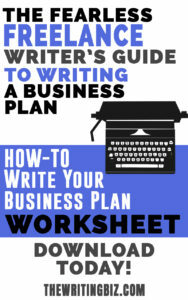 Once your plan is finished you will have a document that is fluid and grows with your business.